Cerastium tomentosum looks like it might be drought tolerant but really seems to like the water, long draughts and frequently, particularly for gardens away from the coast. Snow in Summer needs decent drainage or the lower stems start to rot and patches die out. 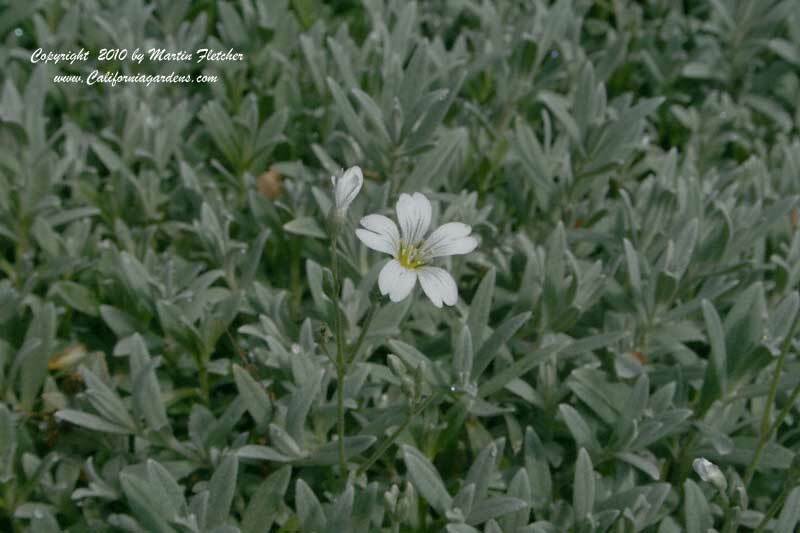 Given the perfect garden conditions Cerastium tomentosum is a great plant. This particular patch of Snow in Summer is in the fog belt near the coast on sandy soil. Snow in Summer is not particularly heat tolerant and does best in more Northern climes. Cerastium tomentosum grows 4" tall and slowly spreads as far as the water and light allow. Cerastium tomentosum is Winter hardy down to zone 3. Flowers and foliage of Cerastium tomentosum known as Snow in Summer. High resolution photos are part of our garden image collection.